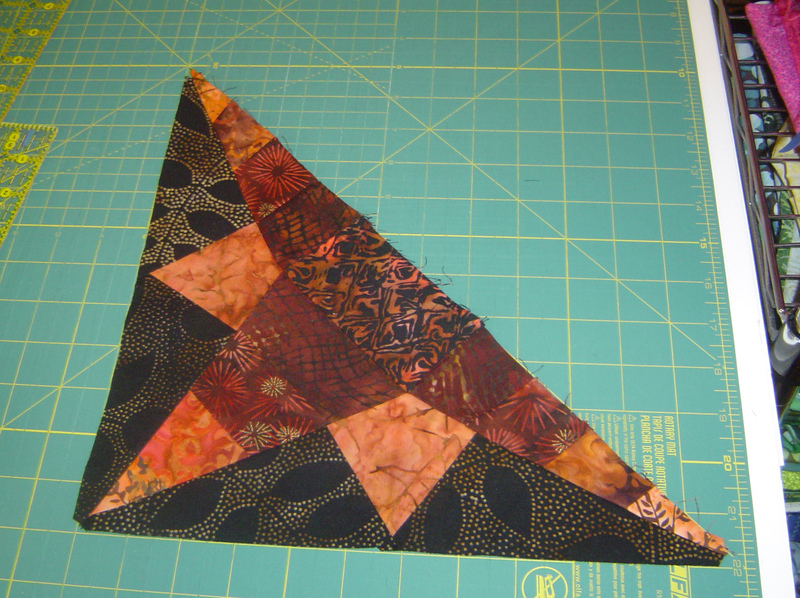 I admit that I am relatively new to paper piecing. I pretty much know the basics, usually only have to rip out the first stitch. Today I ripped out one that didn’t fit, and a 2nd that I had folded underneath. If your paper piecing is too long to print out on EQ on one full page, do NOT, I repeat – do not, use clear packaging tape to tape the pieces together and stick the tape right dab in the middle of the sewing line. No my needle didn’t feel gummy or have trouble, but when ripping out the paper, boy it was a problem. Some of the tape is still there, but only a very very little, so I’ll let it be. But I am considering the best way to put the paper pieces together. You can see I saved myself some problems by doing a few things. 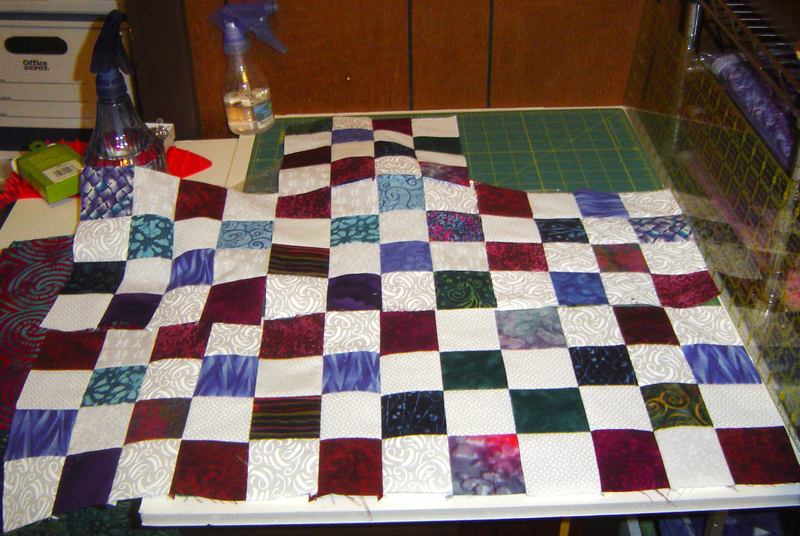 I sewed a strip set of the four graduating fabrics and cut all three pieces from that piece. 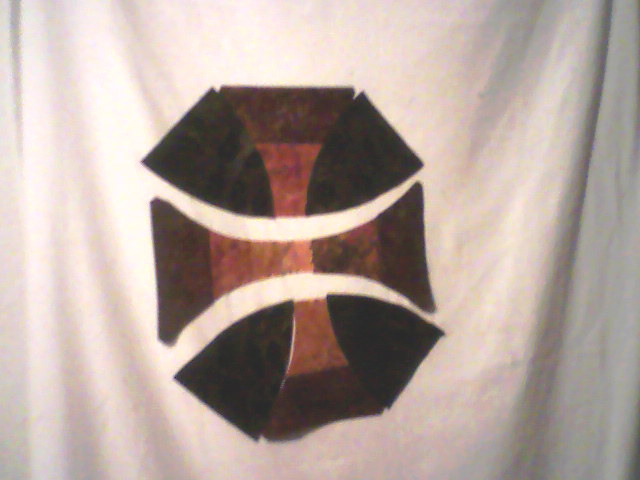 The bottom red/brown I originally intended to piece separately, but in the strip set it went, made it faster & uniform. By sewing strip sets and boxes, my cross wise grain (or lengthwise grain) ends up on the long diagonal side of this block, which is where a lot of stretch happens. 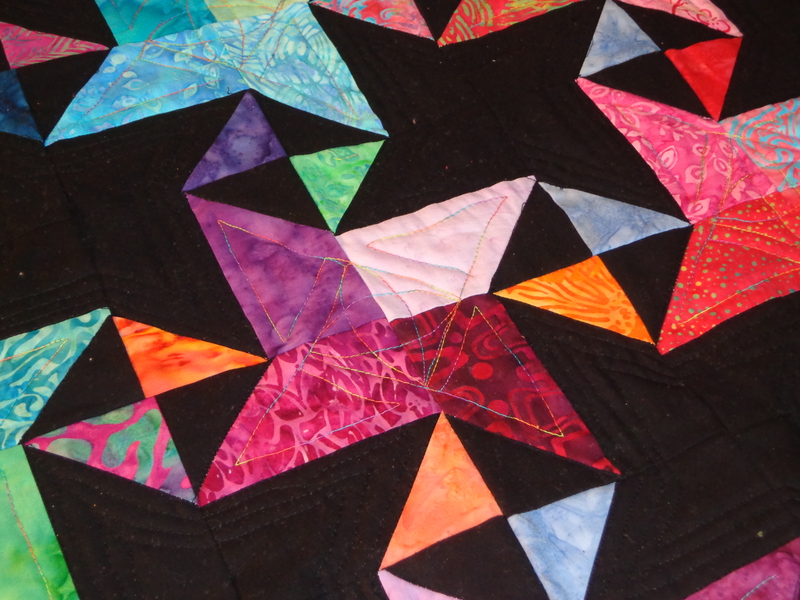 I actually paper pieced the corners of this block, the black and orange middle points separately onto paper – which is where the tape problem is. Now I had two options (or more) on how to piece this together. 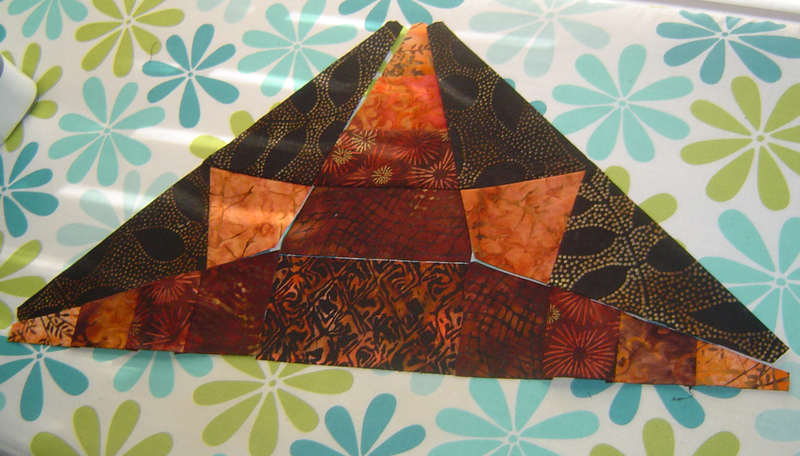 First option is to sew the bottom pieces, then sew on the top orange piece, then using y seams, sew the middle orange pieces (the short legs of the triangle). This was my first instinct, but not the one I took. 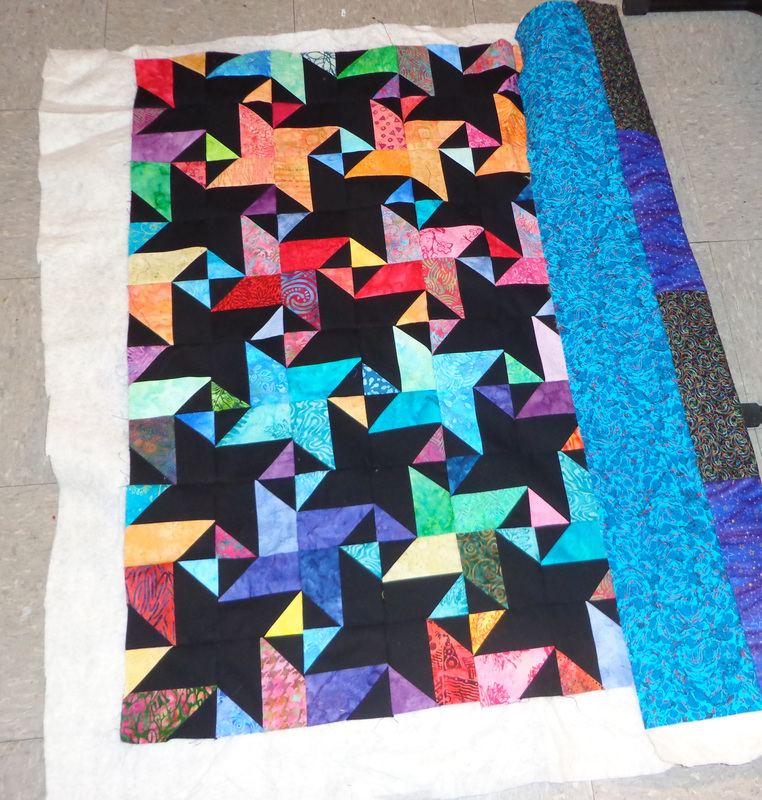 So I decided today on my paper pieced block, that I would sew the top 3 sections together, then sew the bottom 3 sections together, and then sew both pieces together. Which was an … interesting choice to say the least. This lead to some ‘interesting stitching around the corners. And some bunching of the seams near the center piece. But the piece is squared up all perfectly nice even along the diagonal. And I swear I did not cut it down. 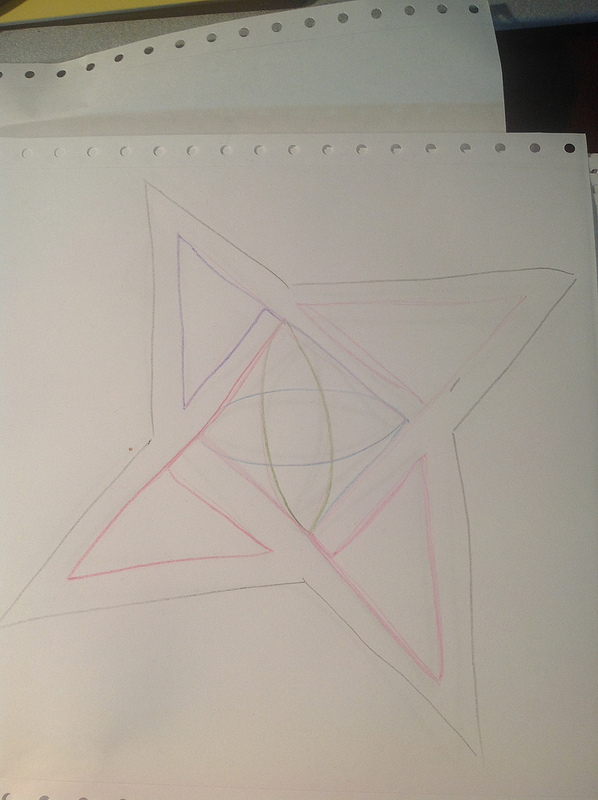 So I do want to try again with option 1 on piecing this together and see if it’s any easier. Essentially I’ll be doing the same thing with different lengths of stitches, but it’ll be good to try another way. Experimenting and all that. And that’s all I did today — too much time taken up with other things. I have sent my Strip Twist blocks, so two people should have them within a week. So shortly, I can post pictures of them. But for now you get to see pictures of my left overs. The only actual block for which I have plans, is the block on the top right. That’s going in a swap. I accidentally created the extra blocks when I realized I didn’t cut enough 4.5 squares to go with it. You know, what, I am LOVING these smaller leftover “quarter blocks”! 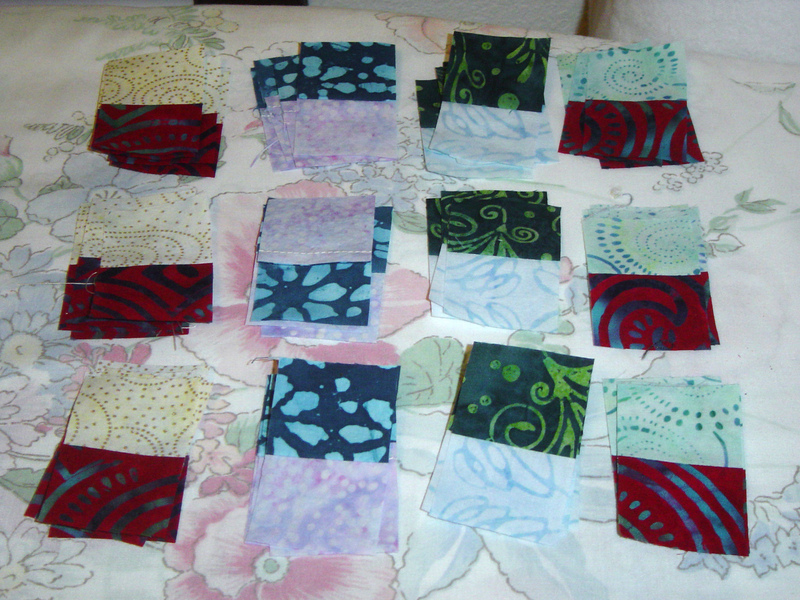 Okay, some of the blocks, I had created before, *blue and yellow* but these 2.5 inch things sewn together into cute little 4″ finished blocks … I can see them either as part of the final design or as borders, or as part of the sashing. Actually it’s the leftovers that I am craving right now more than the actual blocks for the swap. Another set of leftovers I worked on yesterday was result of the strip twist. 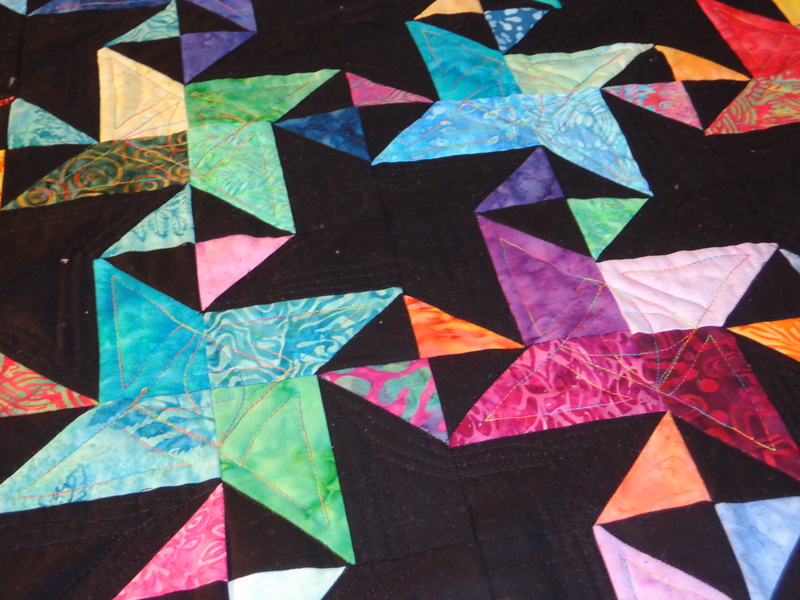 I was able to create 7 different 16 square blocks from my original scraps. 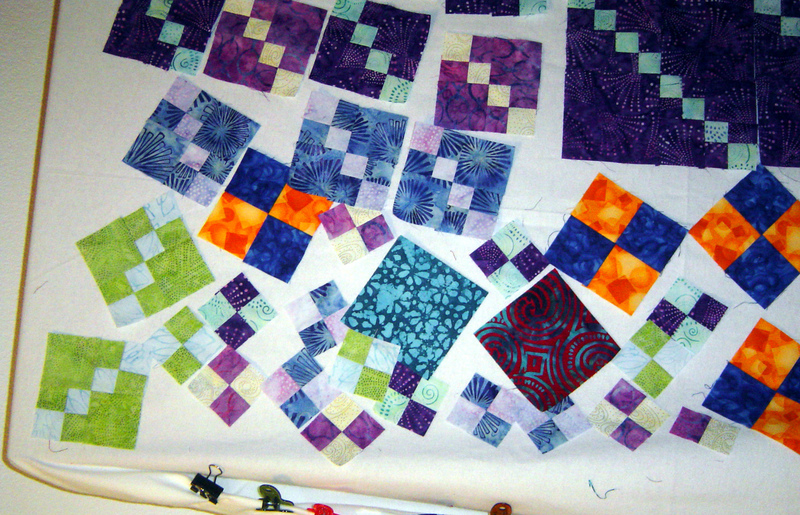 Not sure where the 7th one will be, but I am seeing colored and white sashings with these blocks as intersections. Or I could quick create an 8th or 9th block for this guy. I think I just may have it in me to do one more swap this year, which will be coming up in the fall. We’ll see how I handle and finish the blocks I have already. 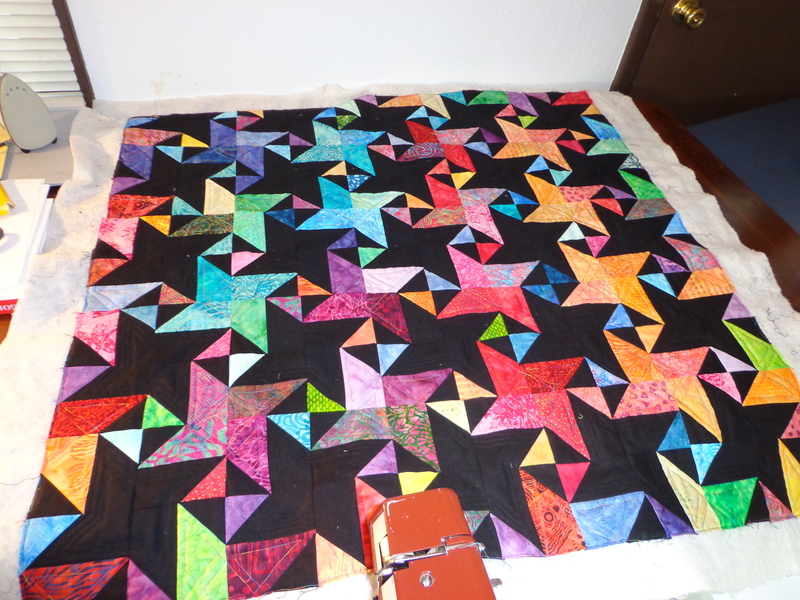 That, and realization that the quilt show is only 3 more quilt guild meetings until it starts has got to light a fire under me to start getting my hurricane block hand quilted. But lately, I’ve been working for these little beauties instead of finishing what I have. 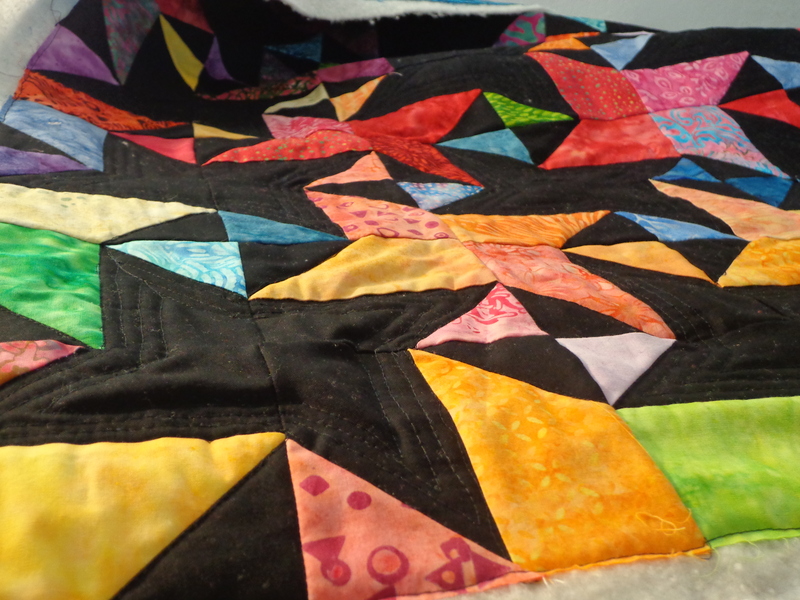 It’s all for a good cause, for a some-day quilt. I do I do I do need more finishes!